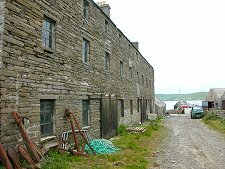 Pierowall is the largest settlement on Westray. It stretches around the Bay of Pierowall from Scarfhall Point in the south to Gill Pier in the north. The name comes from the Old Norse for "Small Bay". The bay onto which Pierowall faces, once known as Hofn is now, with nice circularity, called the Bay of Pierowall. Pierowall is a fascinating village. It gives the impression of being thoroughly functional, with little need for the sort of decoration found in many more easily accessible coastal villages in Scotland. The buildings are almost uniformly grey-harled (rendered) or built of stone: it's like something out of a late Victorian photo of many fishing villages elsewhere whose buildings have since been whitewashed or painted in any of a variety of hues. One result of this no-nonsense approach is that Pierowall is never likely to win a "prettiest village in..." award: but then it's never likely to be entered in one. The other is that a walk through Pierowall really does feel like a walk back in time, despite the newly developed buildings popping up in various places around the bay. The same approach carries through to individual buildings. 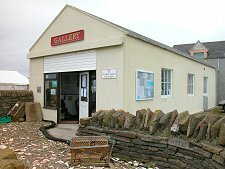 The Pierowall Hotel is externally a remarkably unspectacular building, even when not half hidden behind a marquee as in our image of it. But don't let this deter you from sampling the delights within. We'd been told in Kirkwall that the best fish supper in Orkney was to be had in the Pierowall Hotel. The food is certainly excellent and reasonably priced, and any day trip to Westray should include lunch there. 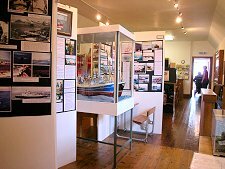 Immediately south of the Pierowall Hotel is the Westray Heritage Centre. 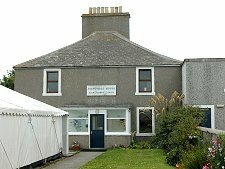 This is whitewashed, but hides reclusively behind bushes and has a small front elevation that belies the considerable size of the centre itself, which gives a fascinating insight into many aspects of Westray's past and present. Just to the north of the hotel is another exception to the "all grey" theme, Seatters Gallery and Studio. 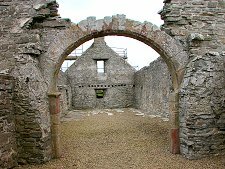 At the north end of the main part of Pierowall and standing above the shoreline are the remains of Lady Kirk. Part of this dates back to the 1200s, though most of what you see today comes from a reconstruction and enlargement in 1674. 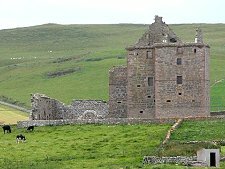 Half a mile inland are the imposing ruins of Noltland Castle, a remarkably well preserved (though never finished) edifice built by Sir William Balfour in the years after 1560. Pierowall once had four piers, but the only one with the depth of water needed for the steamers of the early 1900s was Gill Pier on the north side of the mouth of the Bay of Pierowall. 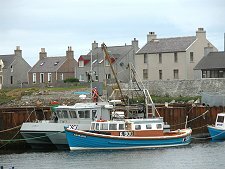 In more modern times, Rapness Pier at the foot of Westray has taken over the main ferry services. 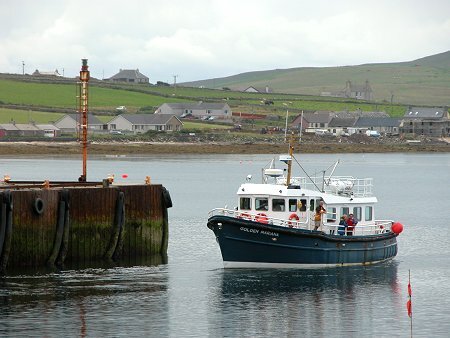 However, the passenger ferry to Papa Westray continues to operate from Gill Pier. It also has a marina with a range of facilities for visiting yachtspeople. And the local fishing industry based at Gill Pier supports a crab processing plant overlooking the harbour.